Senior Jacob Teeter crosses the goal line in the team's first game Sept. 1 against Ridge View Academy. Teeter and the Moffat County High School football team will need to score big again at 7 p.m. tonight at the Bulldog Proving Grounds in order to stick with Rifle High School's high-powered running offense. In week two, it’s a different story. The Bulldogs will take on Rifle High School, the defending Western Slope League champions, in an important early-season matchup. The Bears enjoyed an undefeated regular season in 2011 but were ousted in the state quarterfinals by Windsor High School. Rifle sports a run early, run often-style offense that rarely puts the ball in the air. In the team’s first game against Coal Ridge High School, a 45-6 win, the Bears ran for 456 yards and passed for none. 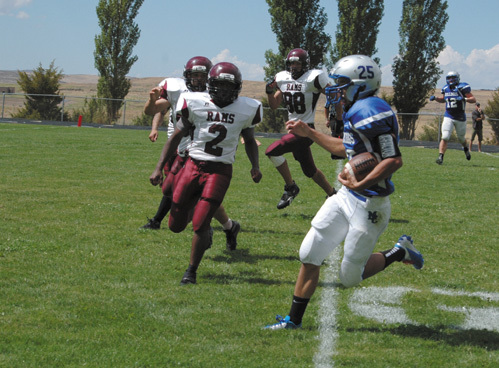 Against Moffat County last year, Rifle won 48-6. They were able to avoid passing because star running back Ryan Moeller rumbled for 319 yards against the Bulldogs. Moeller, the state’s leading rusher last season with 2,469 yards, is back for his senior season and picking up where he left off, going for 252 yards on 16 carries against Coal Ridge. While the Bears lost their other dynamic rusher, Brandon Kittle, to graduation this season, they may have found a replacement. Kellin Leigh had 111 yards on nine carries in the season-opener. The key for MCHS on defense will be staying disciplined against Rifle’s stacked formations, Hafey said. Another major change from last season’s game will be Rifle’s adjustments to the new MCHS offense. The Bulldogs gained over 500 yards against Ridge View and will be looking to have another strong offensive performance. The Bulldogs spent extra on Thursday time on special teams preparing for the Bears’ variety of kickoffs. As Moffat County’s first league game of the season, the Rifle game is important. Going against one of the top teams in the state (Rifle is ranked No. 1 in the Denver Post Football Poll) is also an opportunity to see where the Bulldogs stand. Nate Waggenspack can be reached at 875-1795 or nwaggenspack@craigdailypress.com. Follow the game on Twitter at @CDP_Sports.